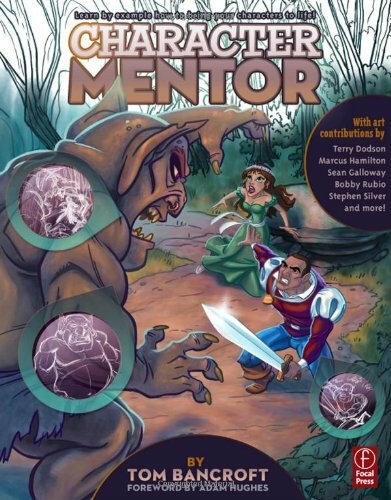 Character Mentor is sort of an extension of Tom Bancroft's earlier book Creating Characters with Personality. The first book focuses on the actual designing of characters. This book focuses on bringing the characters to life with body language, specifically by using expressions, poses and staging. In other words, this book is about acting using your characters. It's filled with tips and insights, just like the first book. As the book title suggest, the teaching style here is one of mentoring. There are many assignments included, and Tom Bancroft has included his students' work, together with his mentor notes on the different ways to improve the result. You'll feel the years of experience seeping through the pages as he explains. It's all very simple and practical tips you can use to improve your characters instantly. There are many wonderful illustrated examples in the book to show how important acting is to creating believability. One look at them and you'll be able to guess accurately how the character is feeling, who the character is or what the scene is about. These are all done without dialogue. The goal of the book is to impart the knowledge of getting to that level of clarity with your characters, the same sort of clarity you would expect from a masterful silent movie. The book also includes a section on composition. It teaches you how to frame your scene with your characters to better tell a story. While this section is not technically character design, it's still useful knowledge. Several guest artists are also invited to have a go at an assignment. Artists such as Stephen Silver, Sean Galloway, Terry Dodson, etc. You get to see how their interpret the story scene in their own way. This is an insightful book to character design. It's a great addition and supplements the first book well. Recommended to artists with some basic knowledge on character design, which is to say you should check out Creating Characters with Personality if you haven't done so. See I like the first review more. Will this book be beneficial if I purchase both? I'm intending to buy the first one but maybe this book will be a great help as well. I'm kinda on the fence but will probably buying both. You should buy both. They are both good. I really love this book, it teaches a lot on how to properly design the characters and how to emotionally connect with others. Also the assignments are a great way to challenge yourself and put the knowledge in practice. I've already read the whole book and I can tell my character designs are getting better just from reading the book! This one is a good complement of Tom's previous book "Creating Characters with Personality"! 5 stars, highly recommend it if you're serious about becoming a character designer! I'm always watching your homepage . This review was very helpful. I bought it of course.